SALVADOR: Spain captain Iker Casillas had a message for his compatriots after the world champions started their World Cup defense with a 5-1 loss: Sorry. In a rematch of the 2010 final, Robin van Persie and Arjen Robben scored twice, and Stefan de Vrij once, for the Netherlands in Salvador, Brazil. Xabi Alonso had given Spain a 1-0 lead with a penalty kick. Casillas made as many as three mistakes as Spain let in the most goals since 1963 and now faces the possibility of a first- round exit. It needs to beat Chile and Australia to stand a chance of progressing to the round of 16. Spain, starting with seven of the 11 players who beat the Netherlands 1-0 after extra time in the 2010 final in South Africa, had more possession in the first half before collapsing in the second 45 minutes. Dutch fans in the crowd of 48,000 at Fonte Nova stadium chanted “Ole” as they dominated the closing stages and the Netherlands players did a lap of the field after the game to celebrate with them. Two teams from each group advance to the round of 16. The runner-up of the Spain and Netherlands group will face the winner of tournament favorite Brazil’s pool. The host nation beat Croatia 3-1 two days ago. “It gives us a lot of confidence, but we have to keep our feet on the ground,” Robben said. Alonso scored on a penalty kick after Diego Costa went down under a challenge by de Vrij. Costa, who was born about 150 miles from Salvador but opted to play for Spain after receiving dual nationality, was booed by Brazilians in the crowd before being substituted. Van Persie leveled for the Dutch two minutes before halftime when he met a cross from Daley Blind and looped a diving header over Casillas, who had come off his goal-line. Robben added a second after 54 minutes, when he beat defender Gerard Pique and fired in. De Vrij made it 3-1 when he squeezed the ball into the net after Casillas, challenged by Van Persie, failed to catch the ball. The goalkeeper received a yellow card for complaining to Italian referee Nicola Rizzoli that he was impeded by Van Persie. 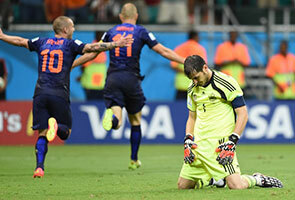 Casillas failed to control the ball with his foot three minutes later, allowing Van Persie to get another goal, and Robben added the fifth after a defensive mix-up between the goalkeeper and Sergio Ramos. Spain hasn’t allowed as many goals since losing 6-2 to Scotland in 1963. V!VA: Which airline crowned 2017's best? Looking to retire? WhatsApp breaks record! V!VA: North Korea is slicker than you think!